The Medieval Academy of America is now accepting applications for “Interoperability and Medieval Manuscripts,” a three-day digital humanities workshop co-sponsored by The Medieval Academy and the Beinecke Rare Book and Manuscript Library at Yale University. Co-taught by Benjamin Albritton (Computing Info Systems Analyst, Stanford University Libraries) and Lisa Fagin Davis (Executive Director, Medieval Academy of America), the workshop will take place at the Beinecke Rare Book and Manuscript Library from 9-11 July 2019. 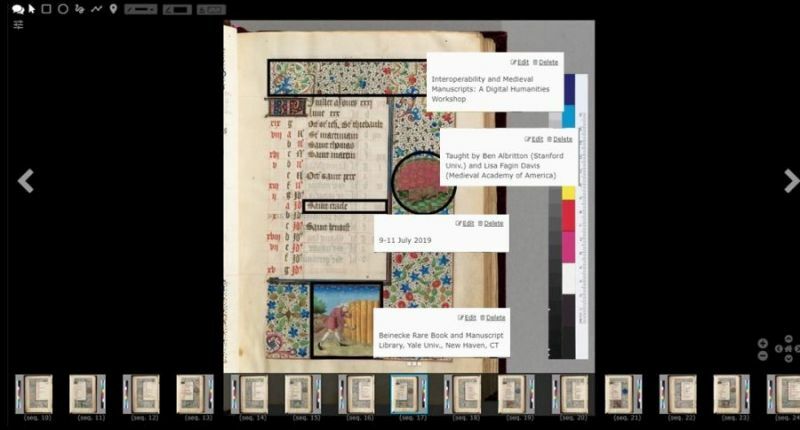 Participants in this three-day intensive workshop will be introduced to the International Image Interoperability Framework (IIIF) in combination with shared-canvas viewers and annotation servers, learning how this technology can facilitate new methodologies in manuscript and art history research. Working with their own images, participants will 1) upload their images into a IIIF server (if they aren’t already served by a IIIF-compliant platform); 2) present the images in a shared-canvas viewer; 3) work with the instructors to develop annotations and tags in keeping with their research project. Due to physical space limitations, the course is limited to twelve participants. Applications are welcomed from medievalists at all levels and will be judged primarily on the potential that interoperable images hold for the applicant’s research project or professional goals. Participants should already have access to or possession of the images they will be working with, if the images are not already online and IIIF-compliant. The workshop is tuition-free, but participants are responsible for travel, lodging, and incidental expenses. To help offset these costs, all participants traveling and staying overnight for the workshop will receive a $300 stipend courtesy of the Beinecke Rare Book and Manuscript Library. Applications must be received by June 1. Click here for more information and to apply. The Medieval Academy Book Subvention Program provides grants of up to $2,500 to university or other non-profit scholarly presses to support the publication of first books by Medieval Academy members. The deadline for proposals is 1 May 2019. Click here for more information.